Rowan Yarn’s Thick ‘n’ Thin is probably my favourite new yarn of the season. I had 6 balls of colour 960, Pyrite, and decided to make Jen Geigley’s Gap-Tastic Cowl to go with a berry coloured blazer I got recently. 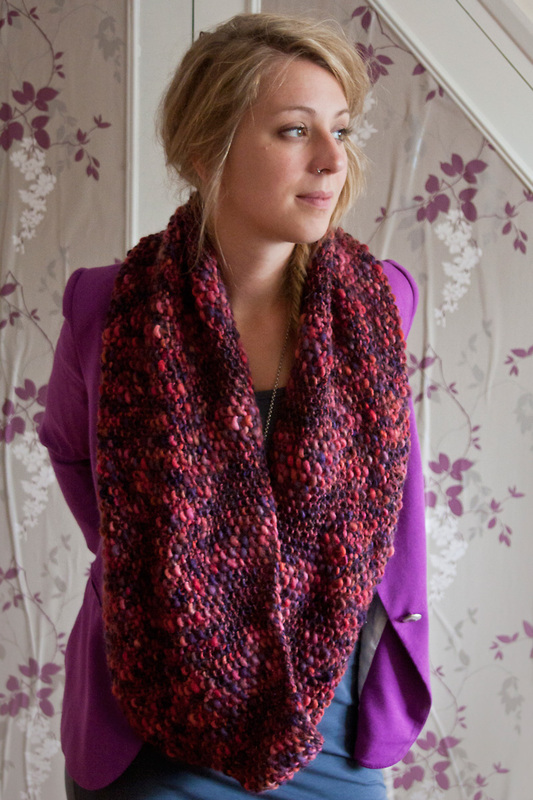 The pattern is available for free at Jen’s Ravelry store! 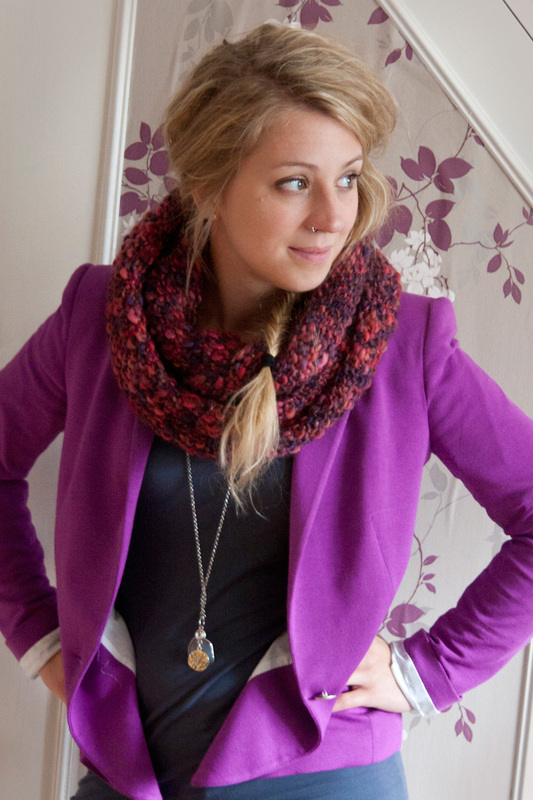 I simply love this cowl! 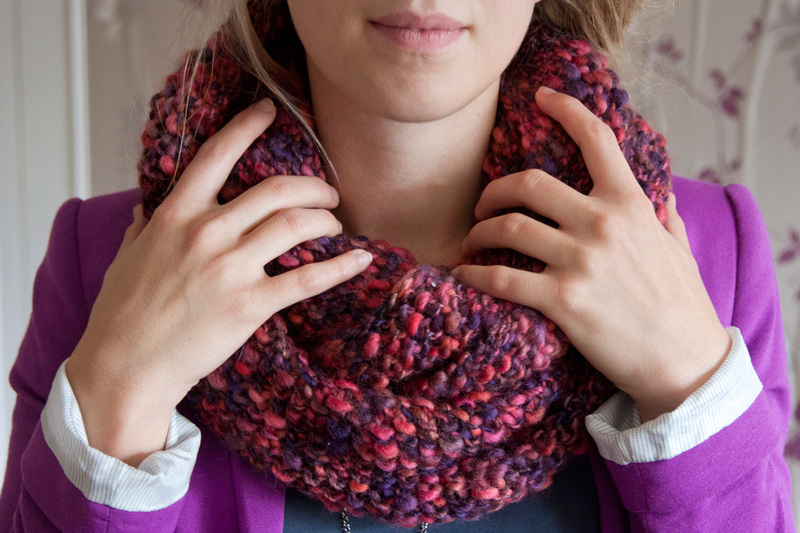 It’s the perfect length, can be worn just as it is or wrapped around your neck twice. You can even wear it as a hood when it’s raining or snowing, that’s how awesome it is! For more notes, check out my project page on Ravelry! The cowl is entirely knit in moss stitch and knits up really fast, two evenings on the sofa watching Dexter did it for me. The pattern brings out the colours and texture of the yarn beautifully, although if I ever make it again using Thick ‘n’ Thin, I’d probably knit it in stockinette stitch to bring out the texture of the fibre even more. Just look at it! Thick ‘n’ Thin comes in 10 beautiful shades, all named after precious stones. Every colourway subtly blends several shades together, and it is definitely an art yarn, considering the inconsistent thickness of the yarn. My favourite colours are Pumice, Granite and Basalt, but the other ones are gorgeous as well. It’s one of those yarns you want to display somewhere in your house because it is so pretty (am I the only person who does this?). Corona, a hooded scarf. Chunky, cosy, and it even has pompoms (ok, I might leave those out, but still, pompoms are awesome)! Comet, a short Cardigan with solid colour accents. I imagine this would go lovely with a floaty dress and your favourite pair of boots. And last but not least, cropped jumper Cosmos because cropped jumpers and tops are everywhere this year, and this is perfect for layering up! Which one is your favourite design? Beautiful! I love that color and that yarn! I know you will wear this often this winter.